Hamel Elasto Twist is an elastic twisted thread exclusively manufactured on Hamel machines using the hollow spindle process. Equipped with completely enclosed spindles, it is the only twisting machine which allows twisting without air resistance and without thread balloon. Non-elastic natural or manmade fibres are wound around an elastane core and cover it completely. Thus, the yarn acquires not only the look but also the feel of the elastic core yarn. Using the Hamel Elasto Twist process it is possible to achieve optimum technological features highly appreciated by those who use it in a weaving mill. Bi-elastic fabrics are generally more difficult to construct. Warp and weft threads, construction and fabric elongation must be balanced correctly to allow proper movement of ends and picks during fabric extension and relaxation. Elasto Twist fabrics guarantee defined elasticity, high wearing comfort, crease resistance and form stability. Elasto Twist yarns are likewise a valued asset in the production of opaque hosiery, bodies and seamless garments as their evenness gives the final product a really attractive look. A new development with great potential are Elasto Twist yarns with a core made of electrically conductive materials used in textile fabrics for shielding electrosmog and to prevent static build-up. These innovative qualities are increasingly in demand for outerwear and in medicine technology. Further areas of application include interior trims for automobiles as well as aeronautical and aerospace industries. 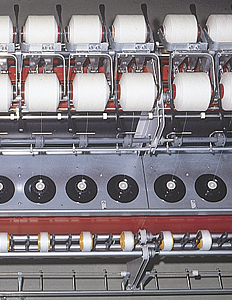 Using an additional unwinding creel, it is possible to feed-in further yarn components. This allows to produce twisted yarns as a combination of various materials which may also contain elastane. The finished product is thus given additional functional properties, for instance to achieve special optical effects.